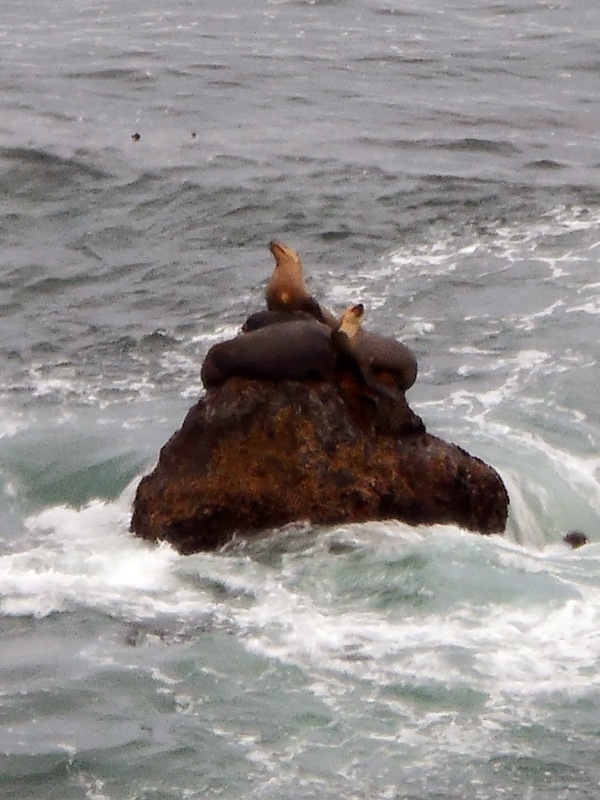 The Point Dume Sea Lion Colony hangs out on the rocks off the Point. They are familiar local characters who enjoy the surfing and swimming at Little Dume Cove as much as the humans do. They are intelligent, curious and cheeky, and often pop up to check out the action on the beach, and have been known to swim right up to unsuspecting humans. Photo © 2013 Suzanne Guldimann. Point Dume's sea lions are survivors. They once had all of Pirates Cove to themselves as a private haul-out beach, now they eek out a more marginal life on the inaccessible rocks at the foot of the Point Dume Headlands and on the rocks called the Pinnacles just off shore. When the weather is sunny and the water calm, you'll see them lounging on their backs, sunning their fins. From the trail that runs along the cliff edge on top of the headlands at the Point Dume Reserve you can watch them vie for a coveted spot on the top of the biggest Pinnacle. When the tide is high and the water is clear, you sometimes see them swimming, sleek, swift shapes in the clear water. California sea lions are gregarious and intelligent. They are members of the "eared" seal family, and differ from Malibu's other seals—harbor seals and elephant seals—in that they can "walk" on land using their powerful front flippers. Fast and acrobatic swimmers, California sea lions spend most of their lives offshore, where they live in large, loud colonies. According to NOAA, "the deepest dive ever recorded for a California sea lion is 1,760 ft (536 m); the longest dive ever recorded was 12 minutes." It's not unusual for Malibu beachgoers to see a sea lion pop up and watch them, then disappear and reappear a few minutes later in the same place. 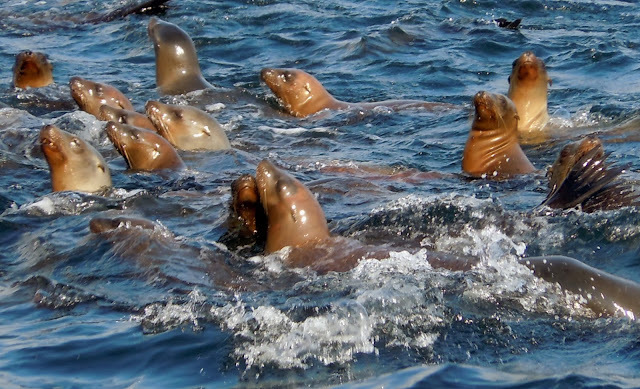 California sea lions males—easy to identify because they are much larger, sometimes weighing more than 1000 pounds, are polygamous, living with a harem of as many as 14 females. They are apex predators, who eat fish and squid, and are preyed on only by great white sharks, killer whales and humans. 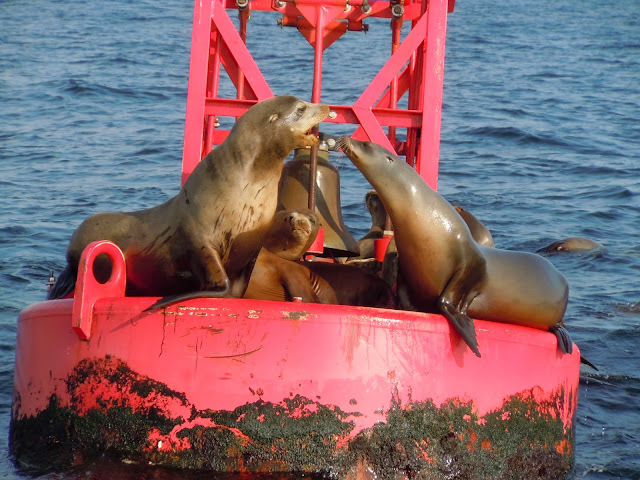 Sea lions are opportunists, who are happy to take advantage of baited fishing lines or the full nets of the squid fishery. California sea lions, like all marine mammals, are protected from human intervention by the federal Marine Mammal Protection Act, but according to the Marine Mammal Care Center in San Pedro, CA, as much as 20 percent of all sea lion cases that arrive at the non-profit organization's treatment facility are there because of damage caused by humans. Sea lions injest garbage, become entangled in monofilament fishing line and nets or, in a small number of cases they are shot, like the four sea lions that were found dead in Malibu with bullet wounds this year. Most Malibuites and beach visitors are glad to share the coast with sea lions. On Point Dume, the "sea wolves" can be heard barking at night. It's part of what makes this community special, and remarkable and worth fighting for and preserving. The alpha bull and several members of his harem on the top of one of the Pinnacles. Can they be dangerous if one is passing close by and they are in a pack with their cubs? It's unusual for sea lions to attack humans but they are powerful and fast and have formidable teeth. It's not good get too close. If an adult feels threatened it can charge and even pups can bite. Best to stay a safe distance away—10 yards minimum. Have fun watching sea lions and stay safe!